There are a variety of challenges you may encounter in the whole process of a campaign project, and of which shipping fulfillment is easily neglected. It can make backers happy because they receive their long-awaited rewards on time, or it will lead the whole project to be controversial due to inappropriate handling. Each aspect involved in a successful crowdfunding project is equally important, and a complete and thorough plan is essential to ensure that every step goes smoothly. Therefore, crowdfunding fulfillment needs to be planned in advance. In this plan, transportation costs and geographical restrictions are factors that need to be taken into account. Here is a very warning case – The Coolest Cooler, with a crowdfunding amount of $13 million, making it the most funded Kickstarter campaign of 2014. Due to the negligence in the control of production costs, resulting in huge logistics pressure in the later period. The Coolest Cooler is an outdoor refrigerator that combines a built-in blender, Bluetooth speaker, USB charging port and other features. The variety of functions was certainly the biggest selling point of this product, but it also caused the production cost of this product to be higher than the original plan, leaving no room for the upcoming transportation costs, so the project creator required backers to pay an extra $97 for shipping, which caused a lot of dissatisfaction from backers. The problems encountered by The Coolest Cooler may be just an isolated case, but there are a lot of unexpected events when fulfilling the orders of a campaign project, often due to incomplete planning. 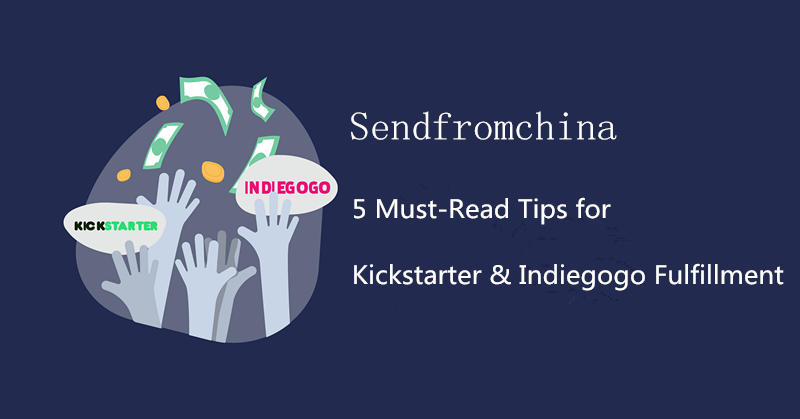 With rich experience in Kickstarter and Indiegogo shipping fulfillment, we have prepared 5 tips. As long as you pay attention to and plan these matters in advance, you can ensure that your crowdfunding projects will not cause logistics accidents, especially global freight. Carry out in-depth research and planning of your project, including all aspects of logistics. Refer to a similar project to find out where your potential supporters are. Then, you need to consider whether to limit the delivery destination to certain countries/regions, or accept pledges from all over the world with higher shipping costs. In fact, the backers of most successful projects come from all over the world. Project sponsors can charge additional shipping costs based on different countries or regions, in addition to that, you will also need to know about the duty, whether the shipping method will be delivered duties paid, after all, backers really do not like receiving rewards and being asked for more money at the door. Therefore you have to plan ahead and make that clear on your crowdfunding page. If you have not mass-produced yet, try to make the size and weight of the product close to the direction that can reduce logistics costs. Some shipping methods have strict regulations on weight and size, and the extra penalty will be very uneconomical. If your product is small enough, you can fit it into a standard envelope, which can reduce costs and avoid custom packaging size issues. If the product is fragile, use bubble wrap or other suitable packaging to prevent damage during transit. These fees should be included in the shipping costs. If you are not sure, you can send a sample package to yourself or your friend for a simple test. It’s considered a good idea to keep the number of variations of your reward as simple as possible. Certainly your backers want more choices from your crowdfunding page, but as our crowdfunding fulfillment experience with so many Kickstarter and Indiegogo projects, it is wise to limit the variations of your rewards. What you have to know first is that, when it comes to fulfilling your orders to backers, the more reward variations you have, the more complicated and costly the process will likely be. If your rewards variations is simple, accordingly, the pick & pack will be cost lowly, as the order processing becomes easier. This may apply to receiving. Additionally, you may even reap its benefits in earlier stage, such as cost saving with your manufacturer if you’re ordering a fewer number of widgets in greater quantities. The most important part of the crowdfunding project is to maintain clear and continuous communication with the backers at the beginning of the project and until the end of the project. On the day the project is launched, your content is likely to help you attract the attention from prospective backers and get their financial support. But if you want to maintain the momentum of the project and spread the message to a wider crowd, you need to keep updating the information during the project’s operation. These updates not only give the backers a sense of engagement, but they also clearly understand the progress of the project. Continuous communication can also dispel some people’s doubts and let them be willing to support your project. It is definitely a good thing to attract thousands of backers, but it will be quite difficult to fulfill all orders by yourself. You can consider outsourcing your crowdfunding fulfillment that specialize in order fulfillment to handle inventory, packaging, shipping, email notifications, and monitoring shipments. They can also expertly solve customs issues for you and give you an economic logistics solution (these offers can offset the cost of hiring them). I hope our advice can help your project. If you have any questions about kickstarter and indiegogo fulfillment from China, you can always contact us and we are very willing to answer any questions.